Rajasthan Public Service Commission (RPSC) will organize Clerk re-exam on 23 October 2016. The written test is to be held at all the district centres of the state in two sessions. 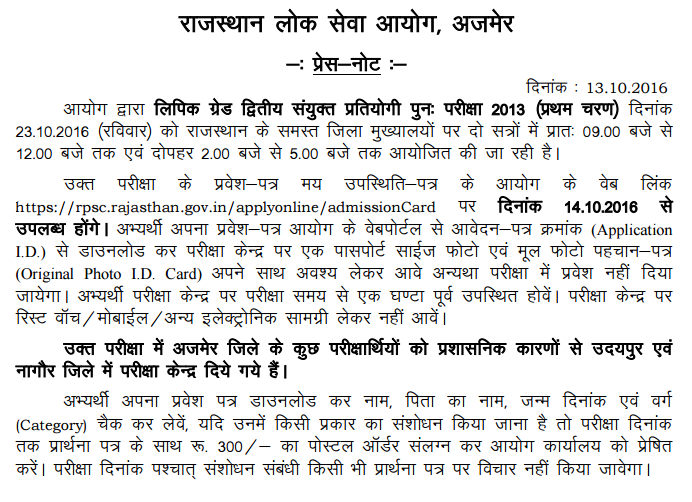 The admit card is available at https://rpsc.rajasthan.gov.in/applyonline/admissionCard link. Here you can download RPSC Clerk Exam Admit card from below. Rajasthan Public Service Commission is going to conduct objective type written exam for Clerk Grade II posts on 23 October 2016. The admission cards are available on RPSC website. The written test will be held on 23.10.2016 from 09:00 am to 12:00 pm and 02:00 pm to 05:00 pm. 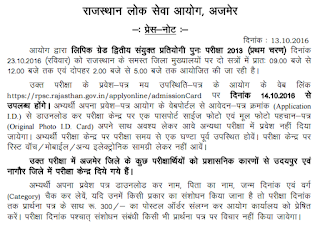 The download of RPSC Clerk Grade II admit cards can be done from here via rpsc.rajasthan.gov.in. The admit card for RPSC Clerk exam can be downloaded using application id and date of birth. You have to take a printout of the call letter and check details on it i.e. name, father's name, date of birth, category etc.